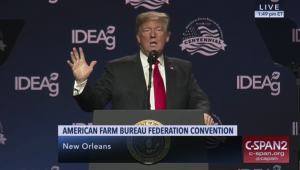 As he did last January in Nashville, President Donald Trump addressed the American Farm Bureau Federation’s Annual Convention in New Orleans on Monday. Today’s update highlights news reports surrounding the President’s appearance at the convention. Wall Street Journal writers Bob Davis and Alex Leary reported today that, “President Trump on Monday said that China is feeling the pain from U.S. tariffs, boding well for a trade deal, but talks so far between the two nations haven’t yielded concrete results. “‘We’re doing very well with China. 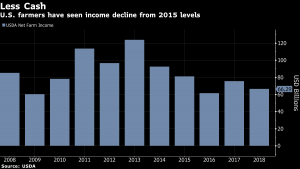 They’re having a hard time with their economy because of the tariffs,’ Mr. Trump told reporters before leaving for a speech in New Orleans, where he was scheduled to address the American Farm Bureau Federation. After three days of talks last week in Beijing, the two sides are still far from making a deal, say people on both sides of the Pacific briefed on the talks. Monday’s Journal article added that, “On agricultural purchases, for instance, the two sides discussed the tariffs, regulations, licenses and other barriers imposed by China that sharply limit rice and corn purchases. On subsidies, negotiators looked at the role that China’s state-owned companies play. Reuters writers PJ Huffstutter and Steve Holland reported today that, “U.S. President Donald Trump on Monday defended his tough trade policies in front of thousands of farmers, a key constituency that has struggled because of his trade war with China, and promised fair trade deals that will put America’s rural heartland back on its feet. ‘We’ve taken the toughest ever actions to address China’s unfair trade practices,’ Trump told farmers in New Orleans at the American Farm Bureau Federation annual convention, an event he attended for the second year in a row as a partial government shutdown in Washington dragged into its 24th day. President Donald Trump speaking on Monday to the the American Farm Bureau Federation’s (AFBF) 100th Annual Convention in New Orleans. “Farmers Are Playing the Long Game With Trump, Even as Woes Build Up,” by Mario Parker, Jeremy Hill, and Shruti Singh. Bloomberg News (January 14, 2019). Also today, New York Times writer Alan Rappeport reported that, “President Trump, seeking to shore up his base of support in rural America, promised farmers on Monday that ‘the greatest harvest is yet to come’ and insisted that the pain they are experiencing from his economic policies would ultimately make them better off. The Times article explained that, “In a stemwinder that touched on immigration policy, media criticism and the importance of standing for the national anthem at football games, Mr. Trump told farmers that the benefits of trade deals that have not been finalized were already being realized. In addition, Washington Post writers Annie Gowen and David Nakamura reported today that, “…Earl Williams Jr., a Rockford, Ill., corn and soybean farmer who is on the board of directors of the Illinois Farm Bureau, said that the trade war has to end. In a comprehensive recap of the President’s address today, DTN Ag Policy Editor Chris Clayton noted in part that, “Over the last 15 years, Trump said, there was a decline in the share of U.S. agricultural trade — though USDA cites that U.S. agricultural exports peaked in 2014 at $152 billion, and the agricultural trade surplus in 2014 also peaked at $43 billion — but that new trade deals will turn the tide for farmers. “The president listed countries that have agreed to buy certain agricultural products such as beef, rice or pork in the past two years, including Argentina, India, Indonesia, Japan, Brazil and beef to China. All of that happened because the White House asked for it, Trump said, but those open markets will look small once new trade deals are done.